Staff and customers were evacuated from the Tesco supermarket in Church Road, Hove, at lunchtime today (Friday 7 July) after a delivery lorry caught fire outside. The evacuation was a described as a temporary precaution given how close the lorry was to the back of the busy store. The lorry driver spotted smoke coming from the refrigerated trailer while pulling up to make a delivery shortly before 1pm. East Sussex Fire and Rescue Service sent two crews – one from Brighton and another from Hove – to tackle the blaze. 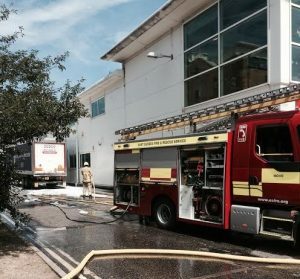 The fire service said: “East Sussex Fire and Rescue Service mobilised two crews from Brighton and Hove to Church Road, in Hove, at 12.58pm following reports of a lorry on fire. “Firefighters wearing breathing apparatus used 1-in-7 foam to tackle the fire. But no one bothered to tell the school that was situated next to the fire. We had to close all windows and doors and get children on the other end of the school within seconds because of the health risk. Need to make sure everyone is safe. Especially the children at the school who were out at lunch only metres from the fire and were inhaling the smoke that rapidly built before most teachers knew it was there.